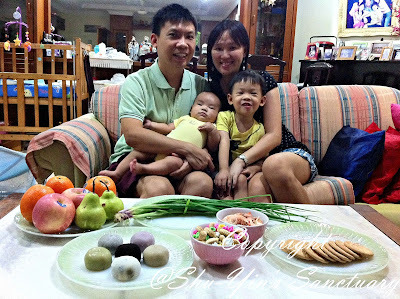 About half a month ago, Khye celebrated his 4 months traditional ritual celebration, just like Shern did when he was 4 months old. 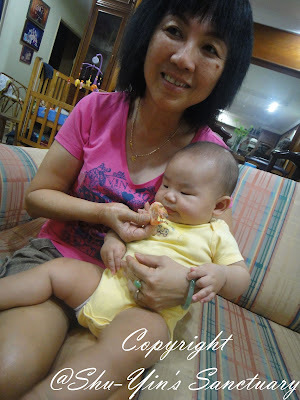 A few days before, during his monthly ped visit, he weighed a hefty 8.0kg @ 4 months old. Fuyoh. 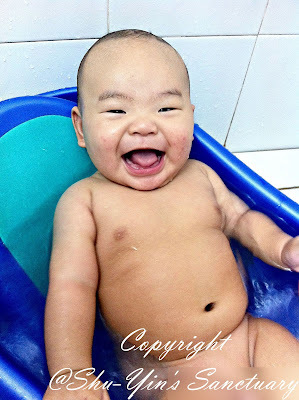 This is happy baby Khye during bath time in the morning. Changed him into a yellow onesie. 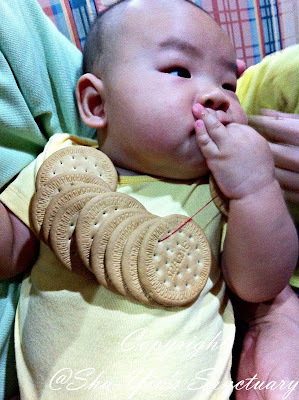 This 4 months old ritual celebration is supposedly said to bless him with good health, good teeth, etc. We don't really follow everything to the dot. 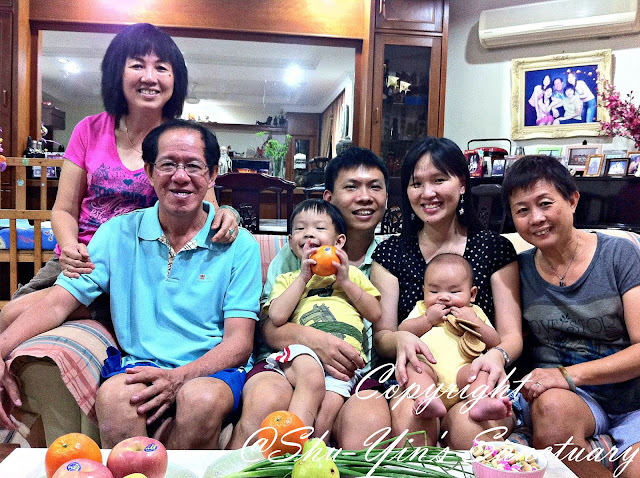 It is just a reason for a family gathering and have fun, enjoying family time. 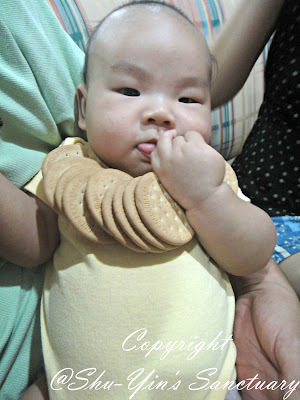 Just like Shern's time, a few Marie biscuits were stringed and hung on his chest. 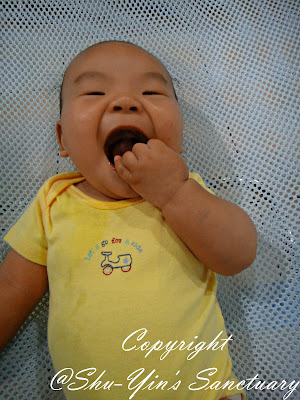 Khye as usual, had his fingers inside his mouth. 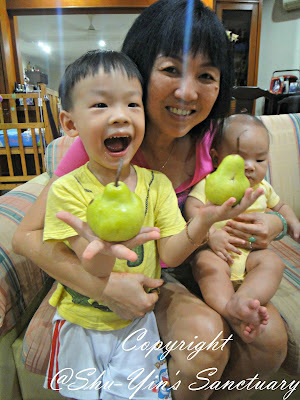 And then we presented him a food/fruit, one at a time. 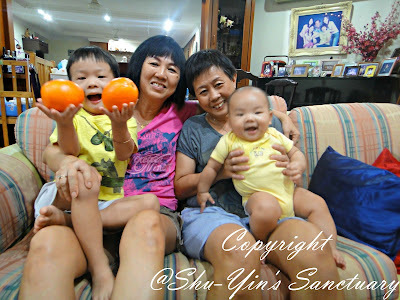 Shern was also enjoying the fun. He ate for the first time the mini biscuits with the colourful sugar toppings. He loves it. 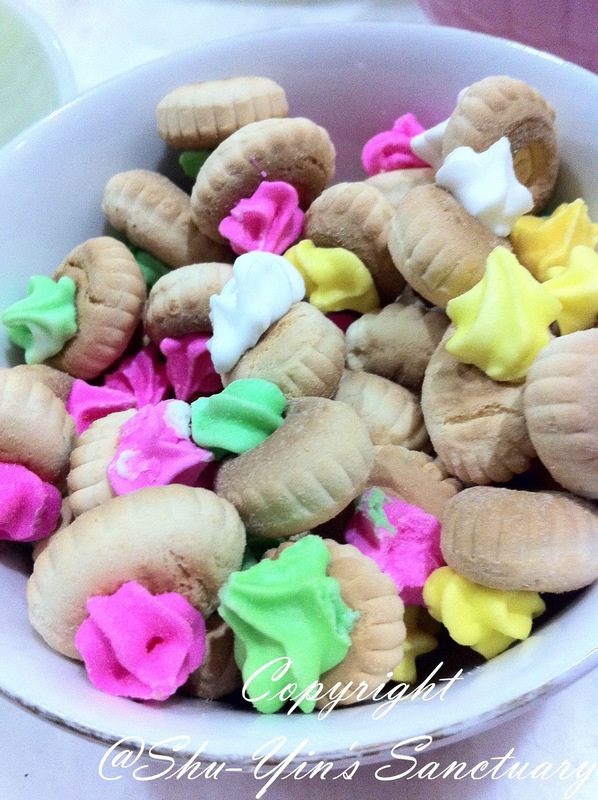 Of course, because they are so sweet. 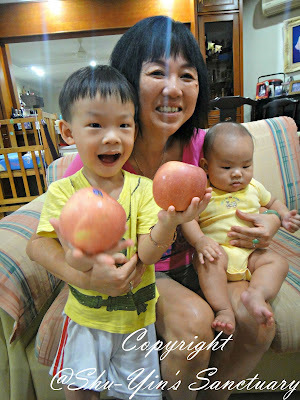 And Shern also had fun posing with the different fruits. 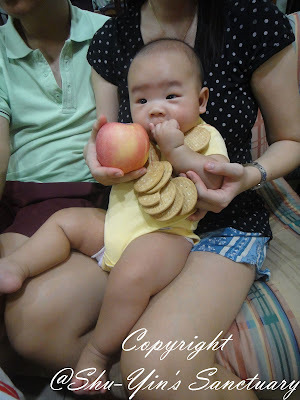 He still hates eating fruits, and doesn't touch any of it. 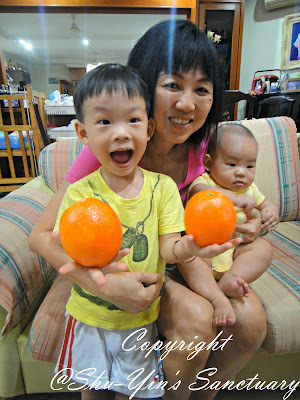 But that doesn't stop him from posing for the camera with the fruits. Haha. 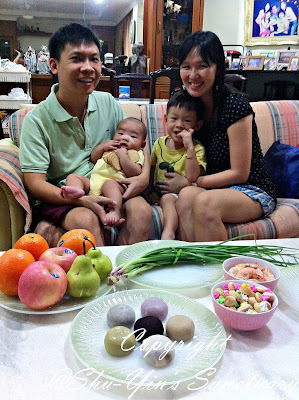 Here's a photo of the 2 babysitters (Pho-pho and Yee-pho) while I'm not at home. 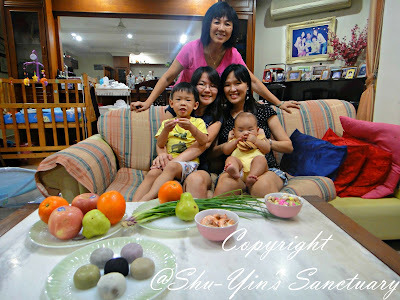 Another photo of the 4 of us. 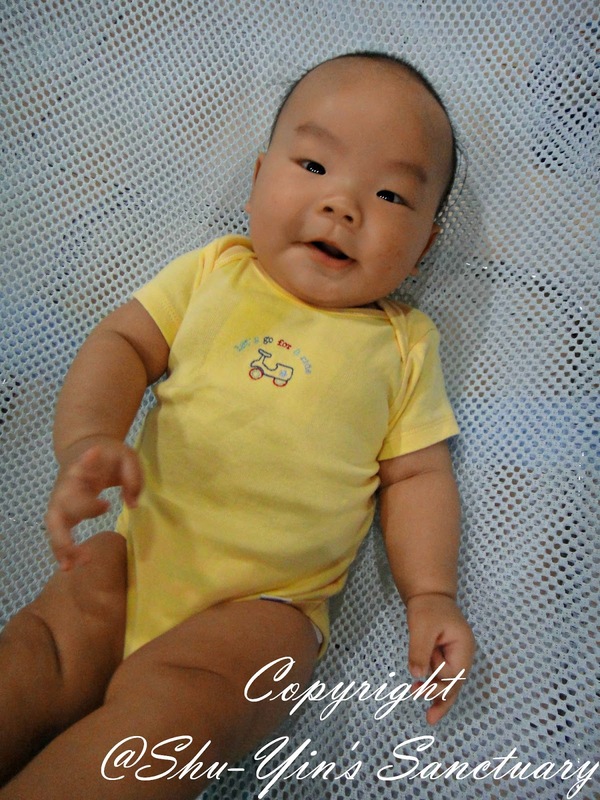 Happy 4 Months Old Khye (although you are 4 1/2mo now).